Very gentle but effective :"The soft rubber bristles make this ideal for short haired and/or frail elderly pets that need something gentle. Love it - and so do my cats (and one is 18)"
The Hunter Ladybird Rubber Brush is a small, every-day tool made of durable plastic with rubber bristles. 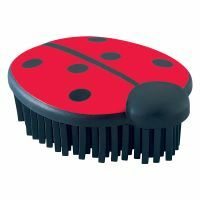 Thanks to its flexible, V-shaped rubber bristles, the practical Ladybird Brush is ideal for removing pet hair - also from carpets and furniture. The brush is especially handy for grooming small animals as well as horses. Simply move the brush in the direction of the V-bristles to remove loose hair and dust from your pet's coat. The brush is great for travelling due to its small size. It can be stored in any bag so it's always on hand. Optimal for quick cleaning on the go. Hunter stands for quality and functionality. Hunter gives you high quality of individual products coupled with attractive designs, while simultaneously providing top functionality and great safety. Very simple to use, works super well and is really the best tool to remove our dog's hair from her bed/carpets/soft seating and car. I love this thing. It's great at getting hair off the carpet, which is good because I have a very fluffy Ragdoll and half the time it looks like it's been snowing indoors. Like another review said, it works best if you brush towards the open part of the 'v' shape of the bristles. I also just can't resist something this cute. This is an excellent remover of hair, especially from cat trees, it doesn't work as well on loose fabrics unless you stretch them but it still does a fair removal job. Always brush with the V open to get the best results – even following this manufacturer's instruction (better worded than the, to me, rather ambiguous zooplus instruction) this brush simply doesn’t seem to work well for me, it looks good but is not effective. This is the best £5 i ever spent ,was looking for something to remove cat hair from blankets ,cat beds and blinds.Tried hoover,lint rollers and sticky tape with little success.this brush is magic ,all items have come up like new,excellent product would recomend to everyone ! My bengal cat loves getting brushed with his brush! Great buy, would recommend. I bought one for myself and was so impressed, I bought 3 more to give as gifts to my pet owning friends. They loved them. Even if they dont remove all hair from surfaces, it balls fur and fluff up to make vacuuming easy. This brush is ab fab. Even my ever so demanding mom can't stop praising how amazingly it works. It picks up every single cat hair on furniture and cat tree etc, even very effective for removing human hair from carpet! Please don't get scared off by the price. It's really a gem. This does not work very well in removing the fur of our extremely furry ragdoll! We have gone back to using the disposable tape style ones. how did i ever survive without it?! I received my ladybird brush in the post today and wanted to immediately try it out...I have to say that I'm really impressed.It doesn't always pull out the hairs but it lifts them to the surface of carpets, settees, etc. so that its way way easier to hoover it all up. Totally recommend it!!! What a great help this has been! With white couch and hairy monsters in spring, this has been the most simple and efficient way to clean. We use it on our bed, clothes, couch, chairs, car seats etc. JUST LOVE IT!